Sitnalta was taken on board the ship; her trunks packed away in her cabin below. She stood on deck with Prince Navor and watched as the ship cast off. She stood waving as King Gerald and Queen Aud got smaller and smaller the further from shore they got. Sitnalta was both excited and scared as she found herself surrounded by water on all sides. She knew that the boat was safe, but she didn’t realize just how far from land they would be. However, her fear was soon short lived as Prince Navor walked her around the boat explaining how everything worked. He showed her how they steered, how the sails worked, and how to tie knots. As the day went on, Sitnalta changed from her travelling gown into a pair of breeches she’d smuggled into her luggage. She was delighted to find that King Parven didn’t mind her unusual attire, and soon she and Prince Navor were climbing the masts like a pair of monkeys. He took her up into the crow’s nest to show her all the sights of the sea. She looked at the water around them and breathed in the salty air, feeling as if she could happily stay there forever. ​As the day passed, Navor left her to go look over some things with his father. It was warm out, yet Sitnalta found herself shivering. She didn’t know why, but she felt that something was very wrong. She brushed off the fear, and told herself she was being silly. It was probably the newness of her surroundings, the unfamiliar situation. ​Evening came all too soon for the Princess, and she joined the King and Prince in the royal cabin for supper. ​Sitnalta paused in her eating to give the King a perplexed look. “What do you mean?” she asked. ​With those words, it was as if Princess Sitnalta had two sets of memories in her mind: One where she was the adopted daughter of Gerald and Aud, laughing in the sunlight, riding her horses. The other one, where a cruel looking man with formidable power had taken them from her; He had claimed her as his own and taken the throne, proclaiming himself king. The strange thing was that she didn’t know which was true. She just knew that she had to save the people she loved. Somehow. Four Stars on Readers' Favorite. Five Stars by EBW on Amazon. ​The Kingdom Thief by Alisse Lee Goldenberg delivers a compelling story as the princess’ quest for love is hijacked when the usurper Wilhelm, a common criminal, becomes King. This is the second book in the award-winning Sitnalta series. Although the story is written with Middle Grade to Young Adult readers in mind, it is sure to entertain readers of all ages. This instant classic is a fairytale fantasy chocked full of intrigue and magic. There are princes and princesses, kings and queens with one quirky wizard tossed in for good measure. Excellent reading! Love the story line. The adventure and trials and tribulations overcome in a positive manor. Exciting story plot. Keeps me glued to the story till the end and then leaves me wanting more. Continuing in the tradition of Sitnalta, Goldenberg demonstrates her skill as a consummate storyteller, honed and refined over a catalogue that ranges from epic fantasy to zombie thrillers. Here's what I listened to, or was inspired by, while writing this book. 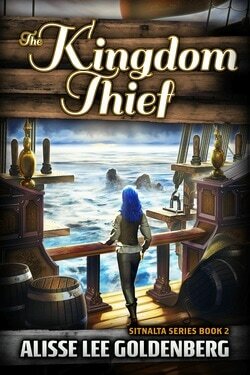 Order Your copy of The Kingdom Thief Here.